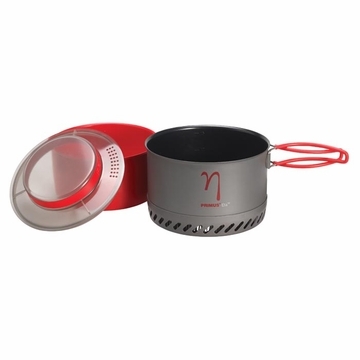 Eta pots are made from hard anodized aluminum with a completely new ceramic non-stick coating inside. The heat-resistant silicone-coated handles are integrated with the pots, and the lid is made from transparent BPA-free plastic with grip-friendly silicone, and can also be used as a colander. All the pots can be nested inside each other - to minimize your pack volume, you can pack the pots with their lids turned upside down. The pots are available in sizes 1.0, 1.8 and 3.0 liters and can be used with every Primus stove on the market. Wt: 19 oz ( 3L).